Little Britches is one of the oldest, continuing junior rodeo associations in the nation. The NLBRA’s membership ranges from Canada to Texas from the west coast to the eastern states. The aims and purposes of the organization are directed toward the interests of the western-minded youth of the nation. It is a non-profit venture to build sound, healthy minds and bodies—to develop character, self-reliance and good sportsmanship through competition in the great sport of rodeo. 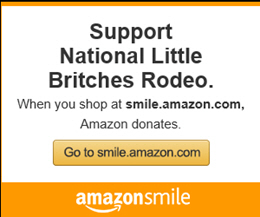 The National Little Britches Rodeo Association is incorporated as a non-profit organization devoted to the promotion of junior rodeo and continued support and encouragement of our nation’s youth. Where there is a need for a wholesome youth program, sufficient community interest, and enthusiasm to support it; where there is a non-profit organization or group of people willing to promote and carry it through; then you have the combination necessary to put on a successful Little Britches Rodeo. The National Office is ready to help establish a Little Britches franchise, lending all possible assistance to the sponsor organization. As you may have noticed we have a new look to the website. We are not done with it and over the next several months will continue to update. However many of the features are currently active. The registration has changed and it will require you to register again. Your old registration is gone. We are dying to try a pair of these new protective boots from 5 Star Equine Products. The findings are consistent, the benefits are remarkable on several levels. Mile High Golf cars is the Official Golf Cart of the NLBFR2K19 and a generous sponsor. Get your cart rented and your decorating skills rev'd up to compete in the 4th Annual Golf Cart parade and contest to win a free 4 seater rental, Tin Haul boots, and more prizes to be announced. Visit www.nlbra.com/finals. For Golf Cart Reservations call 303-833-1400. As most of you know the camping and stall release was last Thursday, the office sold over 520 camp spots and over 1300 stalls in about 8 minutes. Although many of you were unable to get your spots please don't panic. We are busy in the National Office sorting everything out and will begin placing those of you on our waiting list in available spots over the next couple of weeks. We would like to thank you all for all of your patients while we sort through this and someone from our office will be in touch shortly. · The National Finals preparations are well under way. Over the next few weeks please watch for information to be posted about our scholarships. Please pay close attention to the mailing instructions and post mark dates. Each scholorship has it's own requirements. · The Royalty rules and guidelines have been posted under printable forms. Please continue to check back as we will be posting updates about the pageant as we receive them. · Finally if you have questions about your early arrival requirements or if you still need to get them reserved please call the office so we can get that taken care of prior to your arrival. It is important to remember the early arrival procedures will be strictly enforced this year so we want to make sure you all have all the information needed to ensure you are prepared.